“Undo your seatbelts and wind your windows down” My tired mind was trying to process this instruction, as the 4×4 we were in the back of began to lose traction and float, still 15 metres from the safety of the river bank. The river in question was a freezing cold, swollen Icelandic river and I really didn’t feel like some wild swimming at that point. Bryan looked gripped and our Icelandic hosts weren’t grinning anymore – a certain sign that we might be in a spot of bother. 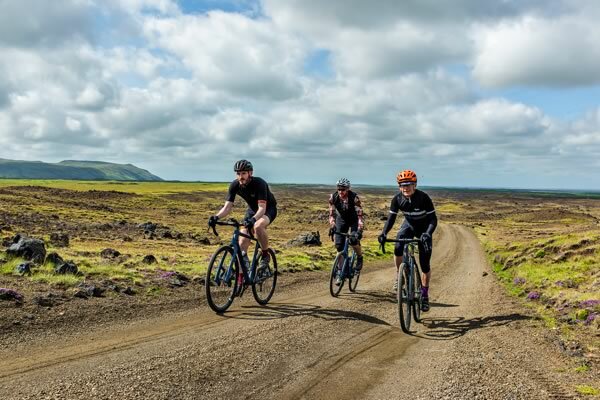 We were somewhere near Landmannalaugar, a couple of hundred Km east of Reykjavick, being entertained by Lauf, as part of the launch of their new True Grit gravel bike. We’d spent the night in a small mountain hut (sort of a big, posh bothy) while a storm did it’s best to blow the roof off and wash us away. There were 20 or so in the party – bike journos, racers, event organisers and the ever-smiling boys from Lauf. We’d ridden the True Grits there (or at least most of the way there) over two days. There was no bikepacking minimalism/misery involved though – we had a support convoy of 4×4’s and a VW Transporter (T5.1, 180BHP 4 Motion for the Dubfans). In the van had been crates of delicious food and pallets of Icelandic ale. The decision had been made over dinner that we’d be driving out, not riding, so no-one was holding back on refuelling and re-hydrating. After all, we had to make room in the van and it would be impolite not to at least try to match the drinking of the locals. Bryan and I had arrived, from Glasgow via Luton, on the Monday morning after the Grinduro UK weekend on Arran. We were picked up from the airport, whisked to Ryekjavick, loaded into 4×4’s and driven to a road head car park near Hekla, one of Iceland’s most active volcanoes and known in the past as ‘The Gateway to Hell’. Well if this was Hell, I was making a resolution to be a much naughtier boy in future, because this place is heavenly. In the car park we were given a True Grit to ride – all size Large test bikes, pre-fitted with different stem and saddle combinations to make everyone comfortable. Along with the bike came a chunky Icelandic wool cycle sweater and little bottles of Aquavit (little did we know, stood there in the sunshine, how useful these items would become). We saddled up and headed out, across a landscape that looked other-worldly, but strangely familiar. Lava fields, lawns of moss, cinder plains and stream-riven mountains all punctuated at regular intervals by, thankfully shallow, braided rivers. We were briefed that there would be 22 river crossings on the first day, but “only two are deep”. Nae bother, the sun was out, the company good and the bikes were superlight and lively, making up for our ‘Grinduro hangover’ weariness. With full carbon frames, refined Grit suspension forks, American Classic wheels and 1×12 E tap gearing, the bikes were a riot to ride. You did have to concentrate on the sometimes loose surface though – a front wheel wash out onto the cinder was like falling onto a parmesan grater (as I soon discovered). Keeping your eyes on the trail when surrounded by that scenery was a proper challenge though. The reason for the familiar look to the land was that, geologically speaking, it’s only a couple of blinks behind Scotland or the Lakes – smooth some lines and cover it in grass, heath and a few trees and we were ‘back home’. One thing that was definitely very different was the language. There was no chance I was following native conversation. Luckily everyone spoke English and the important signs were subtitled. This is Hekla Volcano – to continue is to risk death OK, let’s crack on…..
We rode all afternoon, with a Lauf style feed stop. Hot dogs with awesome ‘Cronions’ (crispy onions), beer, crisps, cake, coffee and beer. I say afternoon, but it was probably evening too, or even night. It didn’t get dark. We rode about 80Km. Accommodation was a private hostel, with bunkbeds, heaters and the afore mentioned catering bus full of goodies. After dinner was a short drive to Langmannalaur hot pools for a dip and some beer, then back to a cave for a fire, some beer, much singing and some more beer. Waking up on Tuesday morning (or was it afternoon, or evening? and Christ was it only Tuesday? ), it was clear the weather had plans. Driving, squally rain was driving the groups in surrounding hostels to pack up and head back to Reykjavick. We saddled up and pedalled out to the first river crossing – “If we can cross that, we’ll be fine”. Some rode, some waded, one took a swim, but we crossed. The next few hours got increasingly windy, increasingly wet and even got dark. One by one, riders bailed and got into vehicles. The river crossings got more and more interesting and the landscape awesomeness gauge held it’s needle at 11. Finally only Head Laufer Bennie was still riding. Us heavier chaps fared better than the racier whippet types and the True Grit bikes were certainly too light to let go of. Keeping the front wheel facing in the right direction was a struggle and at one point my 14 stone carcass was almost lifted off the ground, to be dumped into the mossy rock debris. Fun doesn’t start to cover it (whether it was Type 1 or Type 2 fun depends on who you asked). We finally made it to the overnight hut, where this account began, via some very marginal river crossings. As it poured down all night and the flood warnings poured in, us non-Icelanders were blissfully unaware that the escape route in vehicles meant re-crossing those, now rapidly rising torrents. By lunchtime on Day 3, we were down to one vehicle (not really sufficient for 20 adults plus kit) and had abandoned two 4×4’s, a VW van full of food and beer and 16 slightly less shiny test bikes on a new island. 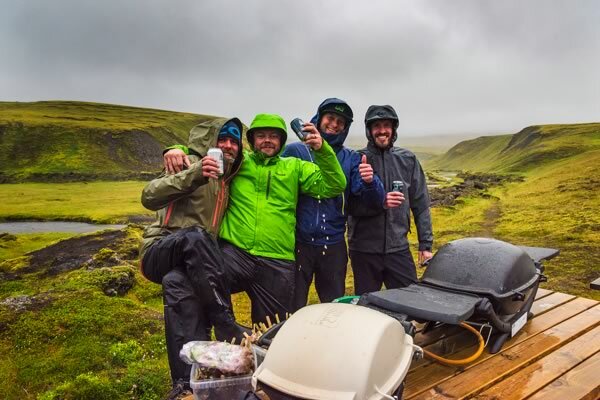 After a bollocking from a couple of National Park warden ladies, and a few phone calls for help, we made it back to Reykjavick, via more Cronions and beer. A most excellent adventure. https://focal.events/wp-content/uploads/2018/01/iceland1-e1516119582953.jpg 400 600 foevlkeqw https://focal.events/wp-content/uploads/2018/01/Focal-Events-logo.png foevlkeqw2018-01-10 11:43:592018-01-17 14:49:55Focal Events head to Iceland, trip report from Andy and Bryan.